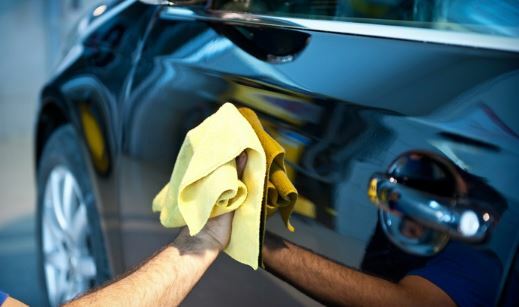 Despite what some people might lead you to believe, there's nothing mystical or magical about hand waxing a car. All it takes is the proper conditions, tools, and technique, not to mention some patience. This article will provide you with the information on the first three. The patience you will need to provide yourself. First, and perhaps most importantly, the surface of your car must be cool before you do anything in the way of waxing your car. This is a critical point. Don't even think about wax--or even washing, for that matter--a car that has been sitting in the sun for any length of time. Doing so opens the distinct possibility--or even the probability--that your car can suffer damage as a result. After you have made sure that your car is cool enough to work on, you need to choose a product to use. There are many of them, some good and others not so good. If you are getting started on a day when it's warm and you might have a little more enthusiasm about getting out and spending some time on your car, then you might want to use synthetic and carnauba based products. Those are your best choice. Otherwise, some products work best on dark colors and others on light colors. Once you have determined that your car is cool and dry, you can get started by putting a little bit of wax on the center of a standard waxing pad. You should work with nothing more than a spot about the size of a quarter. Don't be fooled into believing that more is better; it's not. Next, pick a small area of your car to work on. Now is not the time to get ambitious. Choosing an area of 2-3 feet square is plenty. Now apply the pad to your car. Move your pad in an up and down motion, not circular. Don't press down hard either. Just a slight amount of pressure is fine. Now leave that to dry, or not, depending on the instructions of the manufacturer. Generally speaking, this is the proper waxing technique for your car. If you have a black car, the approach to waxing is slightly different. Instead, there are waxes that are designed to be used with black paint. These products are designed to keep blemishes and other irregularities in your paint from being seen. Having a problem? There are plenty of resources out there that are available to help you. You can select a how to wax a car by hand video or if you are still uncomfortable about doing the job, you can hire a full detail car wash in Elkhart, IN for the job. This includes Elkhart Auto Detailing, which also does car interior detailing in Elkhart, Indiana. Elkhart Auto Detailing knows everything about auto detailing, especially the proper way to wax a car. Call today.